Our heroine, 17 year-old Hana, lives a very interesting life. She has been raised by a very eccentric grandfather, and an aunt who runs a showbiz talent agency. Her boyfriend happens to be Ryou, a handsome model and actor represented by her aunt’s agency. Hana discovered him, and they have been dating each other ever since his debut. Now, after much work, Ryou is becoming very popular, one of the current top stars. Hana is thrilled for him and does whatever she can to support him. As for Ryou, he seems to really care about Hana too, which is a little surprising (well, for shoujo manga) because Hana is a sloppy dresser, with short, funny hair, and glasses that cover her face. We get the impression that if she took off the glasses and dressed up a little she would be very pretty, but Hana isn’t interested in that sort of thing. As the story begins, Hana has two very amazing and important events happen around her. First, her grandfather has finally finished the scientific project he has been working on for the last 70 years. Crazily enough, it seems to involve wind and time travel! Hana doesn’t really believe her grandfather has actually invented a time machine, but she humors him and they go to Kyoto to see some of the many important historical shrines there. Her grandfather seems to have a plan to try out his time machine there. The next major event for Hana is a betrayal by Ryou. Without warning, the media reports that Ryou has dropped his current talent agency, signed with a new one, and will be starring in a string of drama projects! Hana and her aunt knew nothing of this, and it feels like the ultimate betrayal. Things look grim when he won’t answer Hana’s calls. Things get really complicated when her grandfather’s time machine actually works! Not quite the way he planned, of course — I’m sure he would have rather avoided burning down a building in Kyoto and all the ensuing chaos — but the end result is that now Hana and her grandfather are saddled with some unexpected guests. The strong winds of the time travel device brought forward a group of men from the past! And they aren’t just any men. The oldest one is none other than Oda Nobunaga, one of the three most influential men of the Sengoku era of Japanese history! With him are three younger men who fight to protect him. The first is a tall, handsome warrior named Ran. Next are two younger boys who are younger than Hana, but look and act about her age. They are all brothers from a large family that includes more brothers who aren’t with them. They serve Nobunaga. 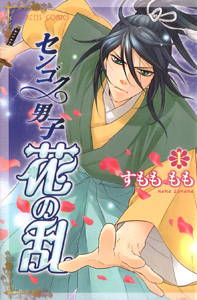 Nobunaga is injured, so Hana and her grandfather take care of him at a house in Kyoto while Ran guards him, and the younger boys hang out with Hana. The samurai take the time-travel explanation with remarkable calm, though there is much hilarity as they discover various marvels of modern living, including toilets, french fries, and bullet trains. The younger boys are especially adaptable, as their boundless curiosity leads them into much trouble. They are especially amazed by modern food (Ice Cream! Chocolate! Hamburgers!) and watching historical dramas on TV. Ran is by far the most serious and surly member of the group. He takes his dedication to Nobunaga seriously, and worries about his master’s health and well-being. Nothing like a possible love triangle involving an idol and a time-traveling samurai! Ahh, I love shoujo manga lol. This is a fun, exciting series with a lot going on. As I said, the art is really nice. The clash of ancient and modern cultures is funny to see. I’m curious to find out what is going on with Ryou, and how things will develop between the surly Ran and honest Hana. I want to read it now!!!!!! !